Australia’s workplace rules are well and truly broken. It’s evident when private sector employers can effectively freeze wages as they drag out bargaining or refuse to negotiate a new agreement. It’s evident when young people are being regularly exploited as they’re not paid properly or have their wages stolen. It’s also evident the rules are broken when workers can’t withdraw their labour while employers can sue workers and unions for any lost productivity. There are now more and more reports showing how broken our industrial relations system really is with regular reports of rorts in franchises, wage theft in hospitality, and the ongoing casualization of jobs and the increasing job insecurity Australians are experiencing; while we have to put up with the constant, never-ending talk about increasing productivity from Morrison’s Government and the conservative media. Here too Australians are fed a lie by politicians and the media. Australians are already some of the most productive workers in the developed world, while contributing significant amounts of unpaid overtime. The myth of the sickie died last century but is kept alive by the Morrison Government and Murdoch media outlets. Closer to home, we’ve got Monash Health after initially accepting there are huge problems from understaffing & unsustainable workloads are now yelling at the sky denying any such problem ever existed. The offer made in late 2018 to increase scientist numbers by 10% has become fake news! Management continues expecting staff to do extraordinary amounts of work just to get through the ever growing mountain of work.. Worst still they keep telling the government there’s nothing to see and everything is fine. Meanwhile scientists are at risk of injury from high levels of work stress and patient safety risks continue to escalate. Unfortunately thanks to governments trashing healthcare and diverting much needed funds away from the public system to prop up the private system, there is a very unhealthy denial by public health executives and governments of the issues facing our members. By continuing to deny the issues around workloads and staffing, public health services are contributing to the poor health of Victorians; and the workforce they rely on to stay well. It’s just another example where profits and surpluses are more important that reducing workloads, easing workload stress and protecting patient and worker safety. And for these reasons and more, it’s definitely time to change the rules! To change the rules we have to vote out the Morrison Government which is why it’s vital to make sure that you’re properly enrolled to vote. If you’ve moved recently make sure you’re enrolled at your new address and as always make sure your family, friends and loved-ones are also properly enrolled. Check your voter enrolment status here. And you can show you support for changing the rules by joining us for the national protest for fair wages and job security. 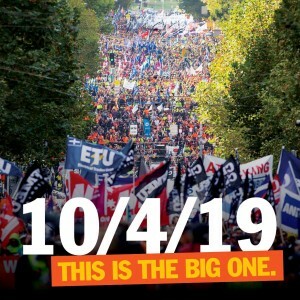 The national protest is on 10 April starting at 10:30am from Victorian Trades Hall on Lygon St, Carlton. The Union will be there joining with tens of thousands of Australians to demand the rules are changed. Join the Union’s contingent – we’ll meet outside at 62 Lygon St, Carlton at 10:15am. Of course there are lots of other activities happening across Victoria you can join to help change the rules at this year’s federal election. You can find out what activities are on near you by visiting http://www.weareunion.org.au/when.